A guy hugs his girlfriend from behind with the boats on the Long Wharf of Boston. 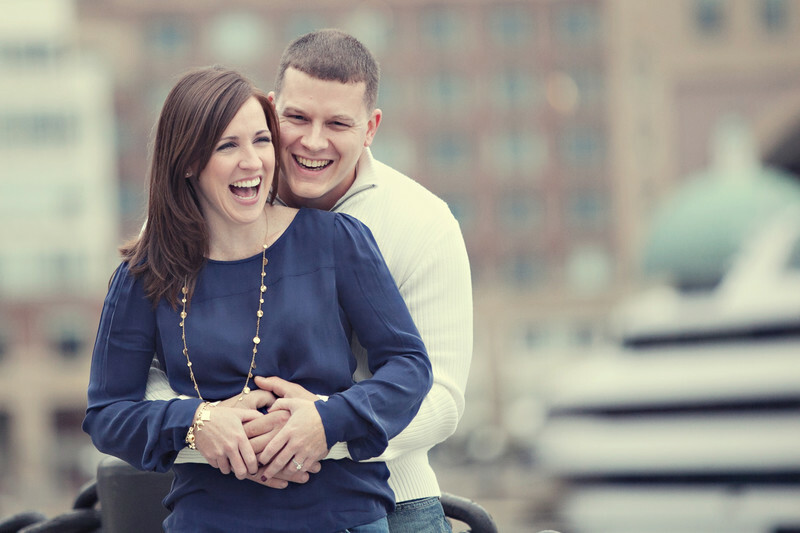 This engagement photo is down behind the Joseph Moakley courthouse in Boston. It's one of my more favorite locations to shoot at. I absolutely love Holly's expression in this photo. I remember I was trying to go for a wide shot of the city in the background, but the Spirit of Boston pulled in and I wanted to try and get it in the shot. I remember I said something like "Oh, look... Alan, your boat is behind you!" That made them both laugh because they do own a boat. Holly's sweet expression and Alan's great smile make this photo perfect. It shows you what a fun-loving couple they are. We ended up walking around downtown Boston to get a ton of different shots and my favorites were the ones with the city behind them. I chose to color this image with a hint of softness because of how soft Holly's features are. The color tone over the image really brings out the couple. Choosing the waterfront in Boston is always my go to because of the way the light softens once the sun goes behind the buildings. It creates one big shady tree to hide from harsh light.